Tanner Industries Inc. is a major supplier of anhydrous ammonia and ammonium hydroxide in the power industry as well as other industrial applications where emissions must be controlled and removed. Our support includes supplying anhydrous ammonia and aqua ammonia in tank truck and rail car quantities. We can also provide ammonia storage tanks and technical service and guidance in terms of the safe storage and handling of the chemical and the application of ammonia in your system. Tanner Industries owns and operates ammonia distribution facilities throughout much of the United States. We are committed to the highest quality products and service in the industry and dedicated to safety. The term NOx, or nitrogen oxides, refers to the reactive gases that are formed through the combustion process. Nitrogen oxides are formed when fuels such as coal, natural gas, or even waste/trash are burned at high temperatures. The 1990 amendments to the Clean Air Act were created specifically to address NOx emissions. These NOx emissions have been directly associated with environmental issues including acid rain, ground level ozone and atmospheric ozone depletion. Ammonia, both anhydrous and aqua, is injected in the DeNOx or de-nitrification process to reduce the NOx and convert it into nitrogen and water, allowing for a cleaner emission through the stack. The emissions control systems that are primarily in use today to facilitate the DeNOx process are Selective Catalytic Reduction; commonly know as SCR, and Selective Non-Catalytic Reduction, or SNCR. The Selective Catalytic Reduction process uses ammonia to reduce NOx by injecting it into flue gases while passing over a catalyst. Extremely high levels of NOx reduction, typically around 90 percent are accomplished in this manner. SCR systems are in use at power plants, high pressure boiler refractory with exhaust, chemical manufacturing plants, and some steel mills and crude oil refineries. The Selective Non-Catalytic Reduction process relies on ammonia injection into hot flue gas streams to react with the NOx at high temperatures. The NOx reduction varies with technologies and fuels that are burned, but typically a 50-70 percent reduction rate is achieved. Tanner Industries is dedicated to partnering with the industrial community to keep our environment clean and safe. We can work closely with your needs to fashion a storage system with tank level monitoring and a delivery schedule that will meet your demand and needs. 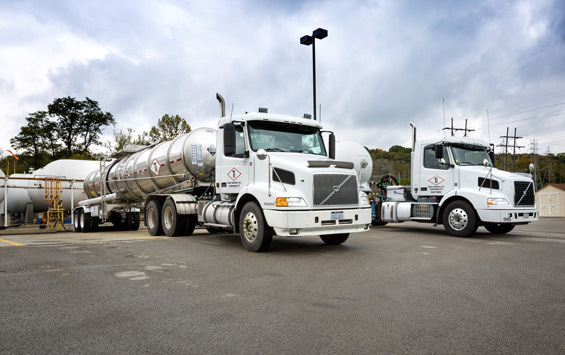 Our delivery fleet is the finest in the ammonia distribution industry and it is complimented with our highly trained and safety dedicated drivers. Safety is the key to the successful operation of our business and yours. Tanner Industries offers several levels of ammonia safety training that can be specifically tailored to your use and operation. Our training programs can be performed at your site and scheduled with consideration to fit all your shift changes. We can also offer guidance and support for Risk Management Programs, Process Safety Management and Process Hazard Analysis to assist your compliance and regulatory matters. Tanner Industries has field sales and service representatives throughout our distribution network to work directly with you for all of your ammonia needs and questions. Our field personnel are supported by our technical service staff at our headquarters. Please contact us at 1-800-643-6226 to inquire on our services and to meet with our representatives.